As written in my previous post, we have successfully arrived to the southern area of Croatia, namely to the city of Split. We had 7 days to spend here, which, as our host at the apartment said, is quite a lot for this single city. 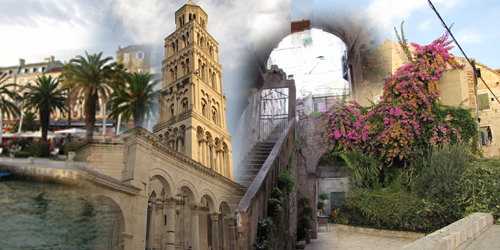 Luckily, Split is surrounded with exciting places to visit, so we had options in case we got bored with it. Indeed, Split is an exciting city: it has nice beaches, a historic centre, lots of great restaurants, for which one can dedicate at most 2-3 days. Our first day was reserved for enjoying some lazyness after a long period without a real holiday. We have basically spent all day on Ovcice Beach. This small bay with a pebble-beach was real close to the apartment and it seemed ideal to relax a bit and avoid the crowds of the rest of the beaches. We rented two sun-chairs for 40kn (whole day price) and an umbrella for 5kn and after a short dip in the water, where we quickly realized we have forgotten our aquashoes at home, we basically sat back and relaxed for almost the whole day enjoying the sound of the waves washing the pebbly shore. Well, speaking for myself, I actually listened to it for a while and then I got carried away and just… fell asleep (hope I wasn’t drooling though :P). It was perfect for getting a sunburn on my lower legs (luckily the rest was under the umbrella) on the very first day… let me tell you that was not a pleasant way to wake up 🙁 … Anyway, I managed to cool it down with lots and lots of sunburn lotion in the evening, so it got better later 😉 . 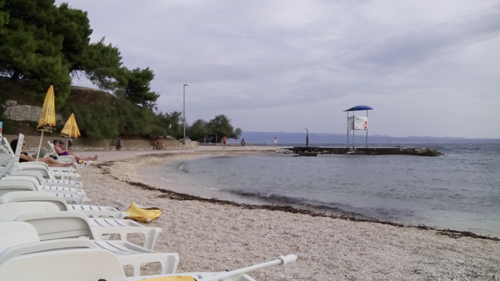 There was another beach in Split to which we dedicated the rest of our beach experience: Bacvice Beach. This shallow, sandy beach is much larger than the previous one and due to the sand, much more crowded. It also has sunchairs and umbrellas, but here you pay for the sunchair(40kn each) and get the umbrella and even small plastic table for free 😉 . Here we did enjoy the sea more, due to the shallow and clean water, I think it is much better than the previous one. The additional great thing here is the presence of more restaurants and boutiques selling food and drinks, so you do not really have to leave the sunchairs (and lose the rental), you can spend the entire day here. The beach is even lit for late evening fun, not that we tried it, but others seemed to have fun, so it must be 😛 . Another thing we did in Split, was to visit the city center, which is basically everything within the old walls of Diocletian’s Palace. You do not have to pay for the museum tickets here, just strolling around the city center is like visiting a museum. Old, narrow streets, great sculptures on building walls all give a unique experience, which did not really compell us to pay and actually check out the museums. The whole atmosphere among the old walls is awesome: the place is full of nice restaurants (with reasonable prices), live music and lots of thematic shops. With a 30-40 minute walking distance from our apartment, we visited it several evenings, each time chosing another restaurant to eat dinner at. As we have seen, this is where the city’s beating heart moves to in the evenings. There were some nice restaurants around the apartment also, so we did stay close on some evenings. Dvor, one of the best restaurants of the city (although a bit pricy) was nearby, so we checked it out one evening. Immediately we ran into trouble: the table we sat at was dodgy so we had to change. To top that, at 9PM they were already out of one of the items from their already quite limited menu (a thing we were planning to try)… things were looking bad, but we decided to still check it out. The apetizer arrived: a small and insignificantly looking pate with some bread… great, we were warned about this… but we were hungry, so we took a bite… and another… and another… wow, now that was the point we realized, sometimes quality beats quantity. It was one of the best pates I ate: soft, creamy and perfectly seasoned… an unexpected score for the restaurant. Then, the main course arrived, confirming, that once again, this place was all about quality. Score, again. The waitress kindly asked about desert, we said no, she was sad… so she decided to bring some on the house: not much, but very tasty: touch down for Dvor. What a turn-around 😉 . For other evenings, we had another great choice nearby: Movi the favorite of many, judging by the fact, that it was almost full of guest the entire day. Here we could get food for average price of all kinds with a pretty decent quality. It was nowhere near Dvor in class, but it was still really good 😉 . For us, these were the highlights and I have uploaded some photos of them here. More about the other days, in the next posts 😉 . I have been meaning to write about this restaurant we went to in mid December, but I got lost a bit among all the stuff I had to do, so I did not really have the time to write about it. So, better late than never, I would lke to present to you Bricks, the hidden restaurant. Due to its location and maybe due to the previous bar that was in its place, Bricks is not a well known restaurant in Cluj. It is also relatively new, so people did not really have the chance to get to know it. II think it is something that needs to be remedied 🙂 . The place deserves a bit more popularity. I like it’s style, it’s furniture and the general atmosphere that immediately gets you, once you go down the stairs and enter the restaurant. To move matters into a more objective light, I’d like to write firstly about the food. The food is… well, I would say special. You do not really find anything here, that you eat in other restaurants. There at lots of varieties to choose from, like Italian food, Chinese food, French food and special sea food (I guess that is the reason the place was given the sub-name:”(M)eating point”). From this huge variety it was quite difficult to choose from, but in the end I settled for pork meat with ratatouille and my girlfriend ate chicken with green pea pure. Both were strange, but great combinations and the way that they were presented were also quite stylish. Next, I will move the focus to the table. There were no table-cloths at all on the tables, which is something that you would expect from a high-class restaurant. Instead, the actual table-cloth was a piece of stylish A3 paper, containing the menu, which is usually an indication of a low-cost restaurant (although I’d rather have a piece of paper that is constantly being replaced than an old sheet that sometimes gets washed). In this case, however, the stylish menu had a special designation: the great big question mark at the “Desert” section. Well, we could not leave with this big question open, so we decided to also have desert and asked the waitress how we could find out what the desert was. She told us she’d be right back with the menu. Why the menu? – we though – we have already seen that and there was no desert in it… Well, we were in for a big surprise, when instead of a menu, she brought a huge stamper and just stamped the missing piece of the menu there 🙂 . Having the desert options in front of us, my girlfriend decided to buy a cheesecake, while I went for the Bricks Special, and boy I made the right decision :). It was delicious. It had all sorts of flavours in it, ranging from orange to cinnamon which I think are best tasted than described. In conclusion, I can say the restaurant is great. The way you get treated for the money you give is well balanced. It is perfect to get out for a little bit of “fine-dining” for not too much money. In the past year we have developed a habit of somehow winding up at Marty, a local restaurant-chain just to enjoy a cheesecake. While the overall satisfaction of the services is not the best, the meal at Marty is quite acceptable and I like the overall theme and atmosphere of the restaurant. 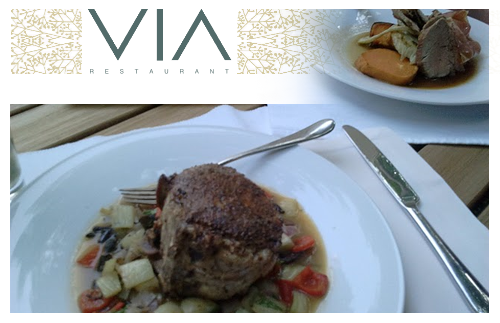 Lately a new restaurant has been opened at Polus Center further enlarging the chain. It so happened, that yesterday we forgot to buy something from the supermarket and we decided to fill this gap by some quick-shopping and a visit to the new Marty restaurant called “Marty West” (referring to the fact that it is in the western part of the city). The atmosphere is again, very Marty-like, the menus are colorful and appealing. I can just congratulate their designer and general “stylist”: the place looks great. I would like to comment, however, on the impression left by the waiters. There are lots of them buzzing around trying to serve everyone and they genuinely look busy and ready to serve. The problem is when they actually serve you. It is not the fact, that they have bad service or the food was brought late or anything usual one might not like. I think there’s just a general lack of organization and devotion from the individual waiters. This would be OK, if it happens only once, but the truth is that this is the general feeling I get, whenever I get to Marty and that is not OK… They should at least try to sell that they are devoted. A smile, a bit more attention would help a lot 😉 . There is, however, a real business-saver at Marty: their cheesecake. And not just any cheesecake, the original cheesecake. It’s delicious. It is not just me, it is everyone I talk to 😉 . It is a bit pricy 13 RON (€3.00) compared to other local prices, but it’s taste and the stylish way it is served is worth it. Once in a month or two it is a must 😀 . So, if I got your mouth watering already, and you haven’t been to Marty lately, my advice is: get to the nearest Marty restaurant, order a cheesecake, try to ignore the incompetence of the staff and just enjoy the cheesecake 🙂 . I decided to write about it, because I think it is a special restaurant in Cluj which goes along well with some of the other ones I have already presented. 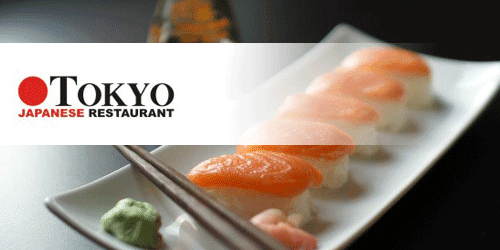 It offers of course traditional Japanese food which is served in a very Japanese environment (although the waitresses are not even Asian… they do wear kimonos…). As one might expect it is not the average go out and fill yourself type dinner: it offers a great exception to all the traditional food one might eat around here. The prices are OK, considering we payed 35/45 RON (€7.7/€10) for a small/normal Japanase plate. The plate included a soup, vegetables, sauces, sashimi and of course a 7/14 piece sushi combination. I have to say the food was great (especially the soup) and contrary to my expectation even I got full by the end of it and sadly did not have enough room left for a delicious hot ice-cream (a delicacy I tried when I was in the U.S. working in a Japanese steakhouse). Another thing to mention is the humbleness and kindness of the waitresses, I think it really stands out from the usual way of serving food in restaurants in Cluj (and that is not that bad at all to start with). So there you have it, a short summary of yet another special restaurant in Cluj. Just try it if you are here once, you will not be sorry. When booking a place, there are two options: outside on the terrace or inside. My friend, who recommended the place, says it is more cozy in the inside. Since it was a hot summer day, I booked on the terrace and my opinion is, that it is quite cozy there also. I think it is a question of mood… This is a bit more sophisticated restaurant compared to the rest of the gang here in Cluj. Expect something different, something new. Do not prepare for a viking-style dinner. Prepare for a bit of fine dining. Expect some nicely arranged plates with exciting tastes that you do not taste on a daily basis. You might prepare yourself for a Babylonian language-mix, because a lot of foreign people visit the place. When we were there, there was a table of Dutch people, one with French people, one with English tourists, a table Romanian people and us, speaking in Hungarian. The noise was not unbearable (the advantage of sitting outside) and what i liked: there was no STUPID background music (in fact there was no music at all), just peace and relaxation. Oh, yes, expect a bit higher price range: affordable, but well suited for what you get.